System Center Virtual Machine Manager (SCVMM) is a management software to let you configure and manage the virtualization hosts, Hyper-V, VMware ESX and Xen Server. Remark: It doesn't support Windows Server 8 beta Hyper-V. I will install SCVMM 2012 in a Windows Server 2008 R2. 1. At DC01, log in as Domain Administrator. 3. 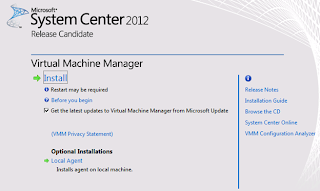 For System Center Virtual Machine Manager (SCVMM) 2012, we need to create the following accounts. Remark: Make sure these accounts are checked "Password never expires" and "User cannot change password" options. 5. Select "Members" tab, click "Add". 8. Close "Active Directory Users and Computers". 9. 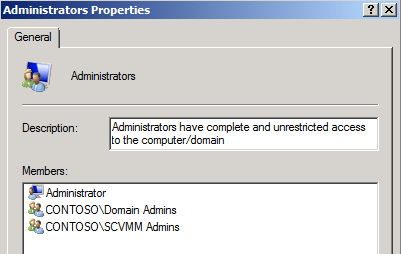 At VM01, log in as Domain Administrator. 11. Expand "System Tools > Local Users and Groups", double-click "Administrators". 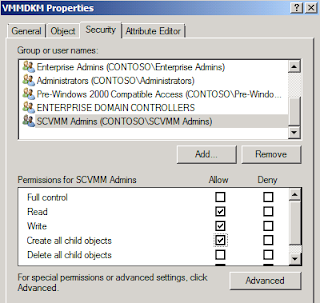 Remark: You can use the group policy to assign the member of local administrators group to SCVMM servers. 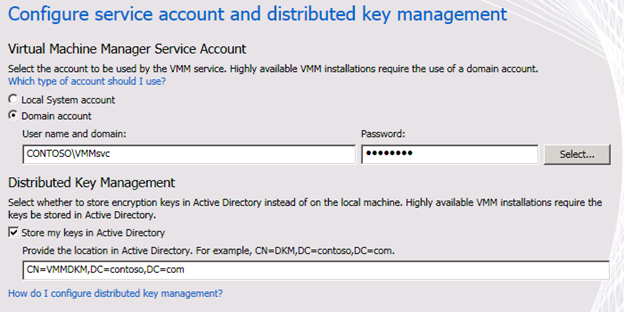 During the installation of a VMM management server, on the "Configure service account and distributed key management" page, you can select to use distributed key management to store encryption keys in Active Directory Domain Services (AD DS) instead of storing the encryption keys on the computer on which VMM management server in installed. 4. 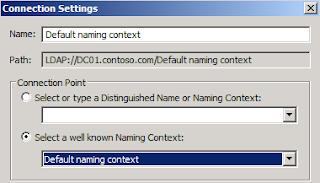 Next to "Select a well known Naming Context", select "Default naming context". 6. Expand "Default naming context > DC=contoso,DC=com". 7. Right-click "DC=contoso,DC=com", select "New > Object". 10. Next to "Value", type "VMMDKM". 14. Launch "Active Directory Users and Computers". 15. On the menu, click "View > Advanced Features". 16. 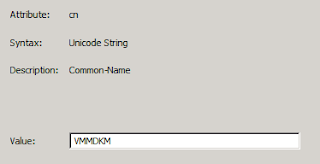 Right-click "VMMDKM", select "Properties". 17. Select "Security" tab, click "Add". 19. Check "Allow - Read, Write and Create all child objects". 21. Select "SCVMM Admins", click "Edit". 22. Next to "Apply to", select "This object and all descendant objects". 23. Click "OK" three times. 1. 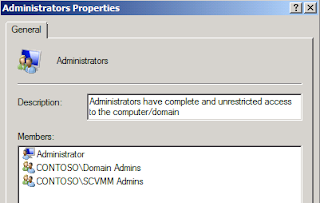 At VM01, log in as Domain Administrator. 2. Launch "Server Manager", right-click "Features", select "Add Features". 3. Check ".NET Framework 3.5.1". 7. Right-click "Roles", select "Add Roles". 9. Check "Web Server (IIS)", click "Next" twice. 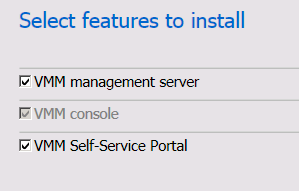 Remark: If you don't install "VMM Self-Service Portal", you don't need to install IIS Services. 14. 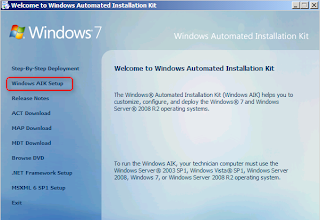 Insert "Windows Automated Installation Kit for Windows 7" dvd, click "Windows AIK Setup". 15. Install the "Windows AIK". If the SQL Server 2008 R2 isn't be installed in the VMM server, the VMM servers need to install the "SQL Server Native Client" and "SQL Server Command Line Utilities" for communicating the SQL Server. However, I will install the SQL Server 2008 R2 in the VMM server for this demo. 16. Insert "SQL Server 2008 R2" dvd, click "New installation or add features to an existing installation" in "Installation" area. 17. 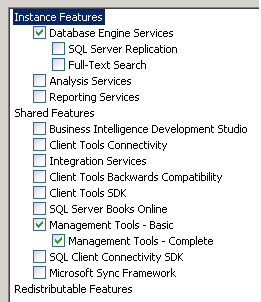 At "Setup Role", select "SQL Server Feature Installation". 19. Check "Database Engine Services", "Management Tools - Basic" and "Management Tools - Complete". 20. Click "Next" four times. 21. 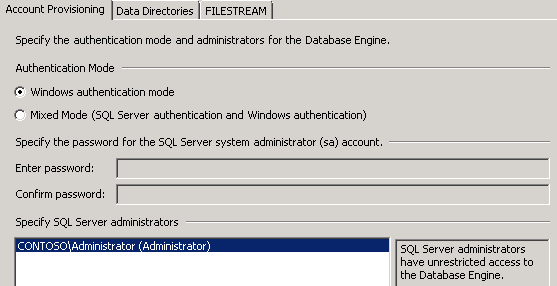 Click "Use the same account for all SQL Server services". 24. Type the password of "vmmsqlsvc". 26. 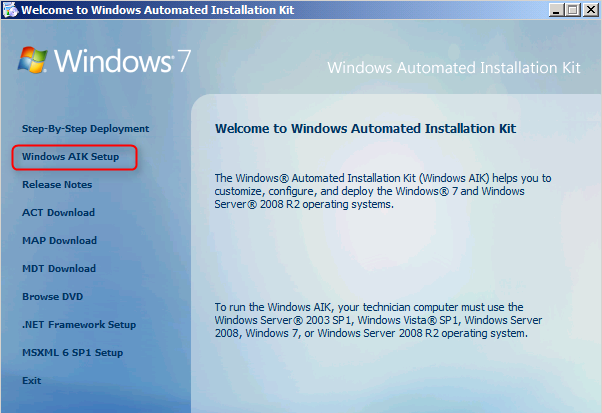 Next to "SQL Server Agent", change the "Startup Type" to "Automatic". 28. Click "Add Current User". 29. Click "Next" three times. 32. 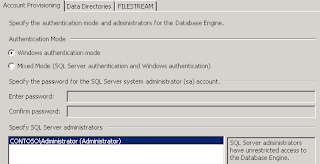 Launch "Microsoft SQL Server Management Studio", log in as Domain Administrator. 33. Expand "Security > Logins", right-click "Logins", select "New Login". 34. Next to "Login name", type "Contoso\vmmdbadmin". 35. 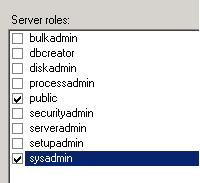 At left pane, select "Server Roles". 38. Close "Microsoft SQL Server Management Studio". 39. Run "SCVMM 2012" setup. 41. 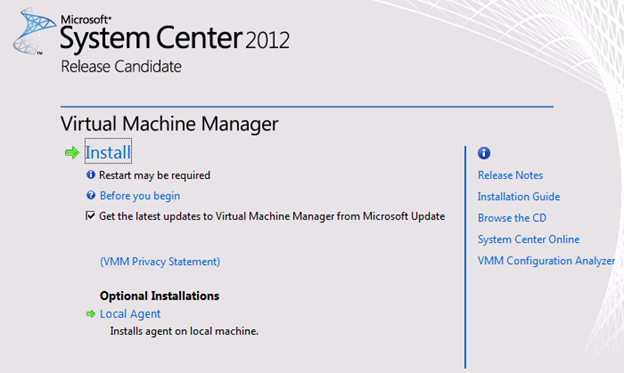 Check "VMM management server", "VMM console" and "VMM Self-Service Portal". 43. Check "I have read, understood, and agree with the terms of the license agreement", click "Next". 44. Select "Yes, I am willing to participate in the Customer Experience Improvement Program", click "Next". 45. At "Microsoft Update", select "On (recommended)", click "Next" twice. 46. At "Database configuration", check "Use the following credentials". 47. Next to "User name and domain", type "Contoso\VMMdbadmin". 48. Next to "Password", type the password of "Contoso\VMMdbadmin". 49. 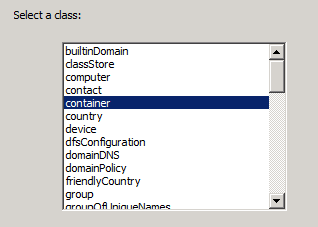 Next to "Instance name", select "MSSQLSERVER". 51. 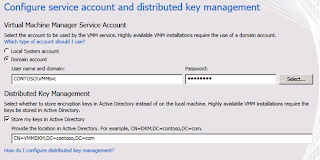 At "Configure service account and distributed key management", select "Domain Account". 52. Next to "User name and domain", type "Contoso\vmmsvc". 53. Next to "Password", type the password of "Contoso\vmmsvc". 54. 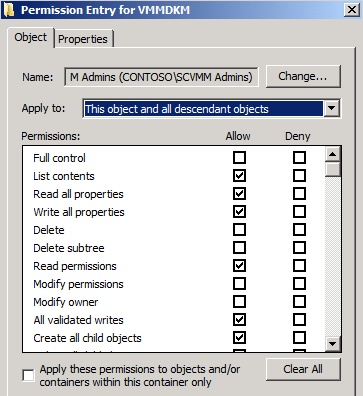 Check "Store my keys on Active Directory". 57. 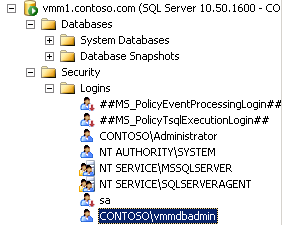 At "Self-Service portal configuration", next to "VMM server name", type "vm01.contoso.com". 59. At "Library configuration", click "Next". Remark: In production environment, you may change the share location of Virtual Machine Manager Library. When installation finished, click "Close". Thanks for the post! I wish MS's guides were closer to this!